Porter. Everyone drinks it. Everyone has a favorite. No other craft beer can inspire the rabid fandom of a true porter devotee. The Pacific Northwest turned out in force to vote in yesterday’s kickoff of the Tournament of Beer: Northwest Porters competition. Phone trees were instigated. Neighbors were harassed. Computer labs were invaded. Our poor little website had to work overtime as droves voted in Round One action. The public picked 64 Northwest porters for the Tournament of Beer, which, as said, kicked off yesterday with two games in the Seattle/King County region and two games in the Oregon region. Brackets don refrigerators, break rooms, brewery hallways and birdcages. Birthday parties have been moved to craft beer serving restaurants. Everyone is discussing Crystal malt and apparent attenuation. It’s crazy fun. Without further ado, let’s take a gander at yesterday’s results. 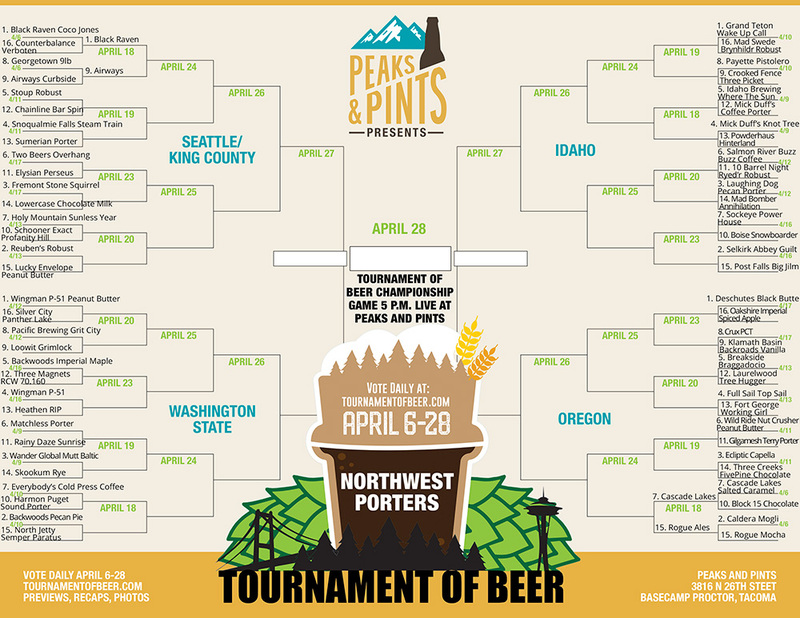 The next Tournament of Beer: Northwest Porters Round One action goes live at 9 a.m. Monday, April 9 right here on the Peaks and Pints website. When a porter beats another porter by 79 percent of the votes, it’s called being “malted” in the craft beer world. No truly, look it up. Black Raven Brewing’s Coco Jones Coconut Porter malted Counterbalance Brewing’s Verboten Porter. No surprise, really. Black Raven Head Brewer Beaux Bowman brings science and standards from his former career, eight years in process control at Kodak Labs (and night brewer at Mac and Jack’s) to precision artisan brewing. Is Verboten now verboten? That’s ridiculous. Its smoke and roast is too delicious to be forbidden. Anyway, Black Raven’s No. 1 seeded Coco Jones Coconut Porter moves into the second round. Three votes. That’s the margin of victory Airways Brewing’s Curbside Porter had over Georgetown Brewing’s 9lb Porter. Was it the fact that Airways has a huge taproom and Georgetown doesn’t? Maybe it was the fact that airline pilots taking off from SeaTac added “Folks, be sure to vote for Airways Brewing’s Curbside Porter” to their intercom welcome greetings. Or, just maybe, it was Curbside’s roasty sweet flavor with chocolate, a wee bit of coffee and toffee brittle. Whatever it was, Airways kicked Georgetown to the curb and moves into second round action. U.S. Route 20 is a slow-paced trip through Oregon’s past and present, with stops along the way for scenic amazement, stargazing, museum-browsing local color and roadside attractions and novelties. It happens to connect Corvallis and Bend, home of Block 15 Brewing and Cascade Lakes Brewing, respectively. Yesterday, there wasn’t museum-browsing or roadside attraction viewing along Route 20. No, indeed. There was speeding. Beer drinkers Ubered back and forth between the two breweries, pounding porters and voting like crazy. It was a brutal battle that went down to the wire. Block 15’s Chocolate Porter had a huge lead during the morning half of yesterday’s voting. Then, the outdoor enthusiasts that make of Bend stored their skis, kayaks and mountain bikes, and joined the Route 20 Uber riders in the pubs. Friday night in downtown Corvallis isn’t so much about voting; it’s about partying. Block 15 became blocked. 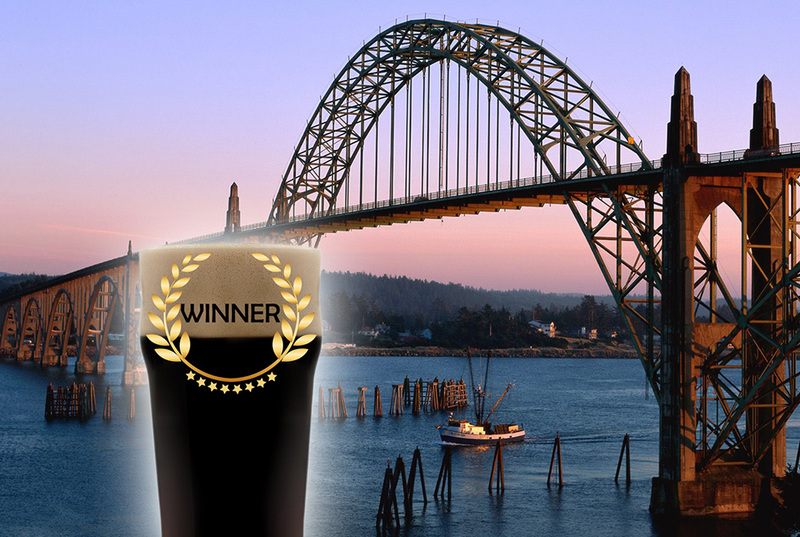 Cascade Lakes’ Salted Caramel Porter poured it on to a 55 percent of the votes win. The lightly roasted, mahogany-colored porter moves into the second round. 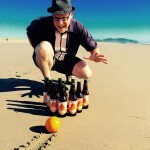 Why did Rogue Ales’ Mocha Porter trounce Caldera Brewing’s chocolate, bourbon, oak-aged imperial porter Mogli yesterday? Answer: Rogue Ales is tough as hell. It rides in Newport, Oregon, a blue-collar town where the crabbers are crabby and fishermen have big trucks and big guns. This is a place where it’s understood that sneaker waves will randomly sweep people off the jetty and to their death every few years, and where you can find Straight Outta Newport, Rogue’s huge West Coast IPA. Mocha Porter went straight outta Newport. It went street. It went Mocha loco on Mogli, grabbing 70 percent of the votes. Cascade Lakes Salted Caramel Porter better stand up and take notice. Rogue Mocha Porter probably intends to go all crazy again when the two meet in the second round.